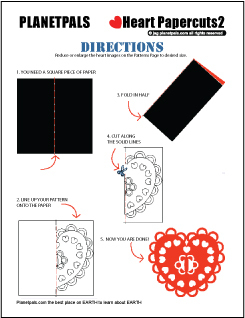 Planetpals Exclusive Holiday Activities: Heart Paper Cuts, Kirigami, Scherenschnitte for Valentines Day , White Day or Any day "
Paper Cutting is Easy and Fun! Did you know that many cultures have enjoyed paper cutting throughout history? For instance in the USA one particular form of paper cutting was very popular this last century: black paper was used to cut out faces and shapes of people and was called a "Silhouette". In Japan paper cutting is called "Kirigami", and in Germany it is called "Scherenschnitte"...thats a pretty big word for something that seems so easy to do. However, some designs can be very complicated and intricate! Once you try it, If you like paper cutting you might do a search on the web for more designs, or get a book at the bookstore or library! Why not try making your own patterns, too! 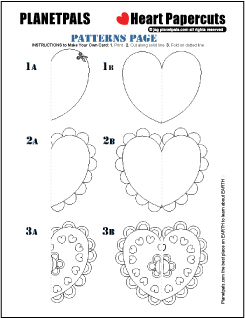 Meanwhile enjoy our Valentine Paper Patterns-and don't forget: share them with someone special! Be a PAL--Use recycled paper! Try using some recycled giftwrap, and practice on newspaper! Use them as decorations around your house or at school! Check out the Green Valentines Journal. Guide to Ideas, tips, crafts, food, more!